I started doing crochet, when I was inspired to make a pair of baby booties for my first baby Mj Elijah, so I started to research, watch video tutorial, study books and tried to understand each symbols and direction given in each pattern. Then because of that desire I was able to make 1 bootie, that colored blue on the picture, not perfect though, but it make me smile, that I had made a gift for my baby that was still on my womb that time. I was excited to fit those booties to her; she was 5 months in my womb. Then I made another one, then another one, hahaha got so excited!!! Then later on I was inspired to make caps, bibs, and then as you can see on the picture, this was my first set, and then followed by the next pic. I praise and thank God for allowing me to have that desire, for I was able to make by His grace and inspirations, gifts for my friends and these patterns will be seen on All Free Crochet.com check their site. 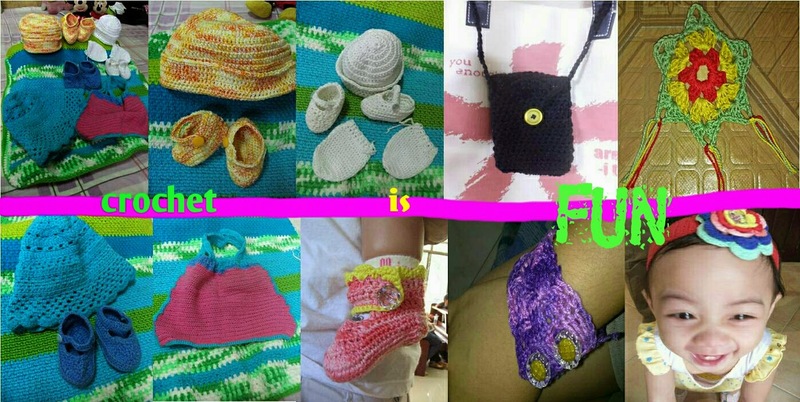 I will share to you some crochet ideas that I personally make, check this out, simple yet useful, have fun!!!! God bless. Update you soon.